Landscaping, Construction of Footpaths, Parking area and developing adjoining gardening area. The project has been designed to be implemented in Phases. 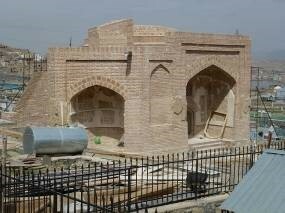 On July 1, 2012, HAFO-CC started 2nd Phase which was "Repair of Stone Masonry of the Foundation of Ghazni Old City Wall". This phase was completed on October 31, 2012. 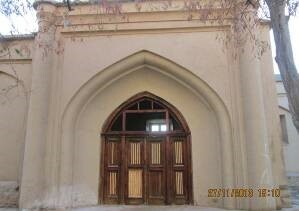 The 3rd Phase which was "The Emergency Conservation of Vertical Repair Works of Ghazni Old City" started on October 1, 2012 and completed in September, 2013. 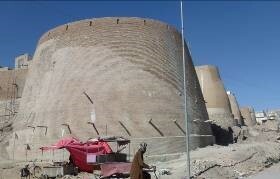 The 4th Phase "Vertical Repair Works at Ghazni Old City Wall" has been started on May 11, 2013 and completed in April 2014. The Phase 4.1 started on October 1, 2013 and completed on May 31, 2014. The project is funded by the RWTH Aachen Center for Documentation and Conservation-Germany/German Foreign Office. HAFO-CC work is being appreciated at all level of concerned Government departments, Ministry of Information and Culture-Afghanistan, Donor Agency and Local communities. 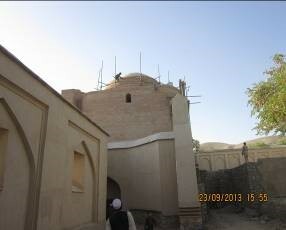 Conservation and Repair of Sultan Mehmood Ghaznavi Complex-Ghazni. 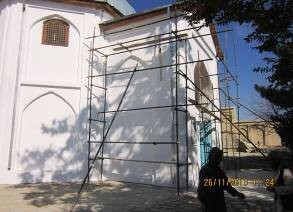 The project was funded by the Ministry of Information and Culture (MoIC)-Afghanistan. The project was started in September 2012 and completed in October 2013. 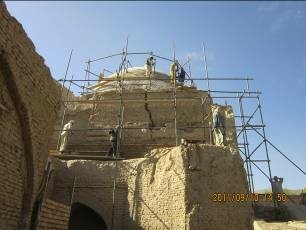 Conservation and Repair of Mausoleum of Sultan Ibrahim and Palace of Sultan Masud-Ghazni. 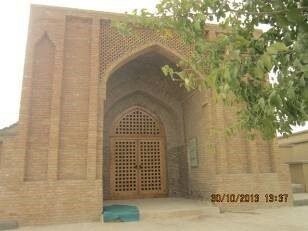 The project was funded by the Ministry of Information and Culture (MoIC) The project was started in September, 2012 and completed in October 2013. 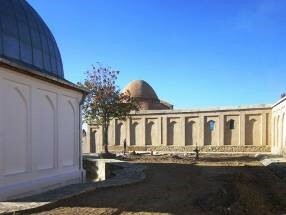 Aga Khan Trust for Culture funded HAFO for repairing the walling at Bagh-e-Babur's Garden in Kabul City. The work commenced in July 2002 and was completed in December 2005. Every effort was made to get the work done in terms of technical details and cost effectiveness. 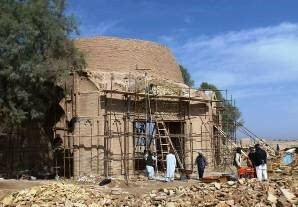 The rehabilitation of walling at Baghi Babur is a part of HAFO program which aims to restore and rehabilitate the historical monuments of Afghanistan. 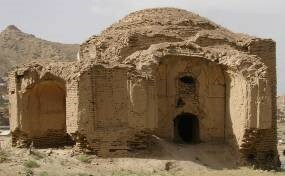 Baghi Babur is important cultural asset that need to be rehabilitated and protected. 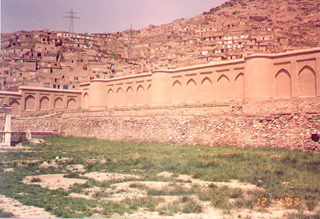 The total area of about 6 hectares used to be surrounded by a 1,023 meters long wall which no longer existed, but was rebuilt and partially repaired by HAFO in the year 2000. 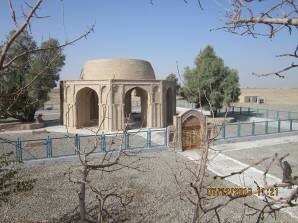 The existed deep well was rehabilitated. Excavation of 370 cubic meters was required for Foundation of surrounding wall which was made accordingly. The Foundation with stone, lime and Cement was constructed. 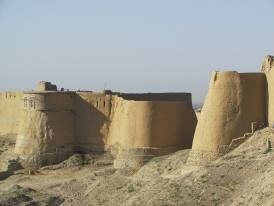 The surrounding wall was partially made of mud bricks , and the south and east wall was constructed of fired bricks. 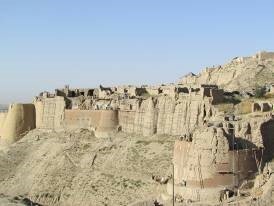 The Mud Brick wall with the length of 649 meters and height of 2.1 meters was built. Work started on August 12, 2000. The Governor and the Department of Culture & Information supported implementation of project and assured full cooperation including access to water for irrigation which was also approved by the Herat Municipality. HAFO planted 6000 fruit and non fruit trees. In addition, 1000 pine trees were planted for wind break. These trees are existed nowadays. The footpaths and side walkways were constructed inside the garden. The project was funded by WFP. 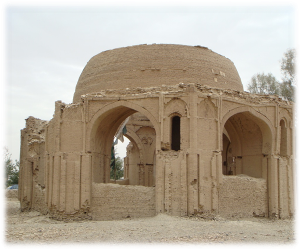 The Madrassa of Sultan Hussain Baiqara which is located to the north of Gawhar Shad Mausoleum and covers an area of 11,000 Square meters. 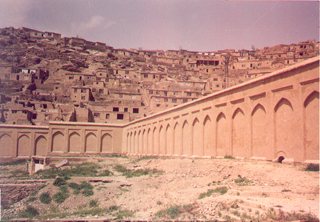 Four tall minarets stand at the four Corners of the formers madrassa. 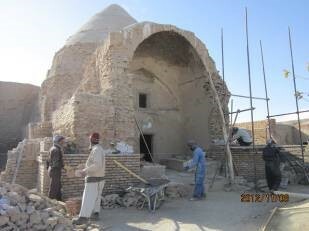 HAFO repaired the SE minaret (Minaret # 4) which was hit by artillery during Russian invasion. 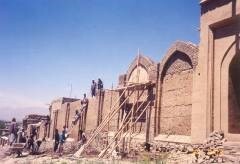 In addition, HAFO constructed a 782 meters long mud bricks surrounding wall with the height of 2.1 meters to protect the site for archaeological research and avoid illegal encroachment. 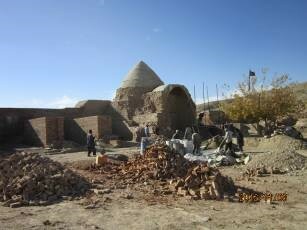 The area was cleaned and a mud wall of baked bricks, with a stone foundation, measuring 250 cubic meters was erected. Fired bricks were placed on top of the wall. To protect the historical structures from vehicles vibration damages, one bridge was constructed over a canal to provide alternate route for vehicle trafficking. 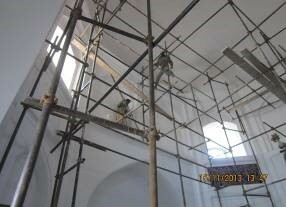 After erecting the scaffolding, a huge amount of pigeon dropping was removed from the inside of the minarets. Broken bricks had to be removed and the staircases were cleaned. Cracks in the wall were filled with gypsum. 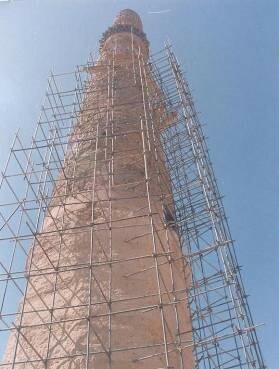 More than four thousands fired round bricks were used to repair the 10 m spine of the minaret. The spine was existed at a height of 35 meters. 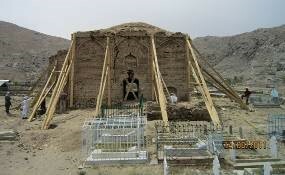 Furthermore, seventy wooden beams were used to strengthen the minaret. 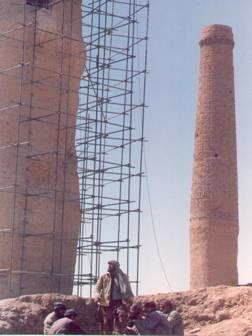 In the year 2000, HAFO worked on the repair and restoration of the minaret of Madrasa of Sultan Hussein Baiqra in Herat which was hit by Russian Artillery during their invasion of Afghanistan. 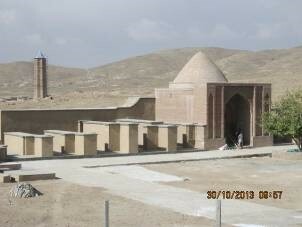 HAFO worked on the mausoleum of Gowhar Shad Begum and the rehabilitation of its garden (also called Bagh-e-Zanana) in Herat. HAFO built a Protection Gabion Wall to protect the Jam Minaret against flood from Harri Road River. These projects were funded by SPACH.